"Layering using a bische", they say. "Wear a bische over a long sleeve t-shirt for a more grown-up look," they say. "Wear a bische over a sleeveless top to look more girly," they say. I am not saying there should be a rule about how to or not to wear a bustier (commonly known as bische/ビスチェ by the Japanese). 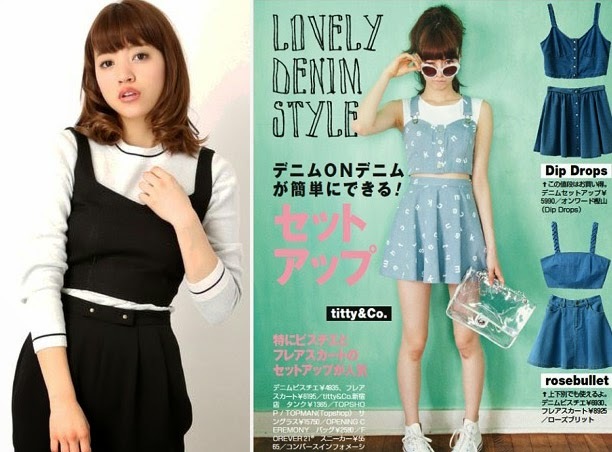 I am just not convinced about these Spring/Summer looks that have been appearing in every single Japanese fashion magazine at the bookstore. Wiki "bustier" and it states explictly it's "a form of lingerie". Lingerie = INSIDE, tops = ON TOP. I've no idea why Japanese magazines are digging these Superman styles. Bustier on top of a long-sleeve t-shirt? Maybe I'll close an eye. BUSTIER ON A SLEEVELESS TOP?! IS THERE EVEN A POINT?! Anyway bustiers are one of the really-really-must-have items now because summer is gonna be hot like crazy. (Spring is almost hot like crazy). Got myself one from my current favourite brand FIG&VIPER!! OOOHHH SHINY SHINY GOLD BUTTONS!! Of course I didn't wear a top under it. I'd be slapping myself. Opted for a [chemical-washed x indigo] denim + denim look! Foldable high-waist skinny pants is from my other favourite brand, GLAD NEWS. FOLDABLE! Seriously, when I move back to Singapore I'll run out of clothes to wear because Shibuya/Harajuku clothing brands have so much personality. Okay, I kinda lied about Spring being hot, 'cos on the photoshoot attempt, it was freezing, my thinnnnn adidas originals parka, as expected, provided no warmth and we had to retreat. Hence photos styles slightly differ - sepia (shot on first day) and colour (shot on a different day). And oh, sorry about the laundry at the neighbour's. I didn't realise until the shoot was concluded and couldn't erase it nicely in Photoshop. A little on the accessories! Studded and spiked love from www.bornprettystore.com (BPS)! I'm wearing their gold+leather studded bracelet and around my wrist, their spiked leather hairband also wearable as a necklace or bracelet. The perfect items for a punk or rock style!! ♥♥♥ I was so surprised the studded bracelet made my skinny wrist looked normal. At first I was kinda afraid it would be too big for me but no, it was totally not the case! Phew! Both these items add up to lesser than USD$10. Ya know, sometimes when you get spiked/studded stuff from the mall, those metal parts aren't actually metal but some strengthened plastic thingy. In contrast, these BPS items, despite their low price, their metal-looking parts are properly made true metal parts! Here's how BPS' spiked leather hairband looks like when worn as what it should be worn as. I've been stalking Stylenanda's spiked hairband styles for half a year and am so lucky to find an exact one at a fraction of Stylenanda's price on BPS! I didn't really know how to use such a hairband so it took me a little time to figure out how to wear it properly. It looked really kawaii once I figured out everything. Hair styling advice? IMAGINATION. BPS' also carrying these FIG&VIPER-ish Lion earrings which I knew I HAD TO GET THEM the first time I found them on the site. TOO CUUUUUUTE!!! A lion-something item never fails!! And the choker! !Diccha know diccha know diccha know? I MADE IT. Awesome desho? ♥ The aunty at the countryside crafts shop thought I wanted to commit suicide when I asked if the shop sells stuff for a "CHOKEr". Serious. I've also uploaded one of these photos to Dr Marten's Share Your Style page on facebook, you can try finding me there too! If you're interested in getting the same stuff + more awesome stuff from www.bornprettystore.com, remember to enter my coupon code "LEET10" when you check out.